Every two weeks ekadashi appears suddenly. Ideally, the ekadashi fasting should be done with minimal consumption of food, but invariably it lands up like a full fledged carbohydrate feast. Carbohydrates, because potatoes seem to be the main ingredient for any dish prepared. I would like to share this farari uttapam recipe with you.Yes, as you guessed the main ingredient is potato, but there are other more exciting ingredients. Don’t wait for ekadashi. Just go ahead and try it out to serve as a snack. Add all the ingredients for the potato layer into a bowl. Mix it well and keep it on the side. For the filling, heat the oil in a pan. When it is hot, add cumin and sesame seeds. Add paneer and saute till it becomes light pink in colour. Add the peanut powder, chilli and ginger paste. Saute for a further 2 minutes or so. Remove from the heat. Add coconut, salt and sugar and mix well. When the mixture becomes a bit cool add the chopped coriander and lemon juice. Mix very well. Adjust the taste of the filling according to your preference. Divide the potato dough into 8 parts. On an oiled plastic sheet or cling film, pat one part into a circle of about 5 inches in diameter. Remember to oil your fingers. Do the same with another part of the potato dough. Heat a frying pan over low heat. Add oil to it. Place one potato circle gently into the frying pan. Divide the filling into 4 parts. Spread one part of the filling evenly over the potato layer. Place the other potato circle over the filling. Gently pat down the seam with a spatula. When the potato layer becomes slightly brown and crispy, flip it over using 2 spatulas. Add oil and cook till it becomes light brown and crispy. Repeat the procedure from step 9 with the remaining dough and filling. Sere hot with either date chutney or a green chutney. Seal the seam properly to avoid the filling from falling out when you flip it over. Wet the seam and then place the other layer on top. Press the seam down with a spatula or a fork but be careful as the pan will be hot. 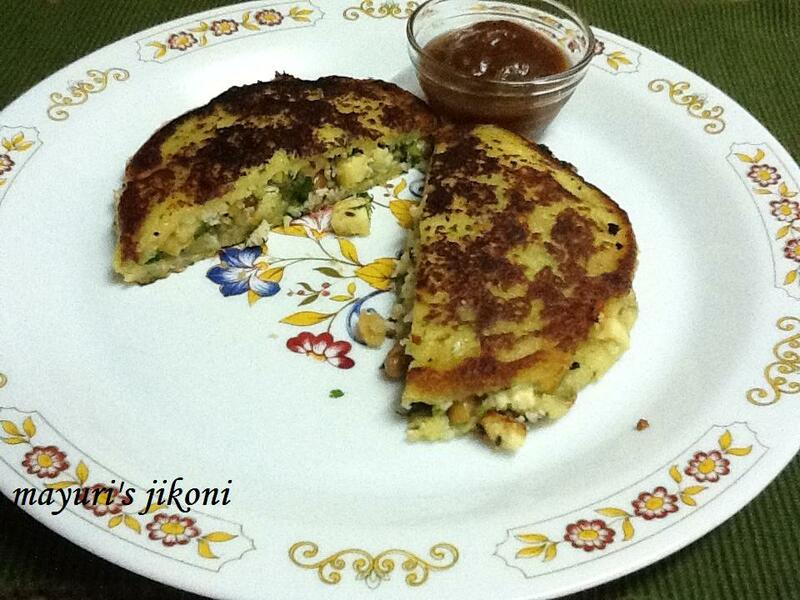 Make the uttapams and keep them warm in the oven at low temperature till ready to serve. To place the potato circle into the hot pan, oil your hand and flip the potato circle onto it.Peel away the plastic sheet. Gently put it into the pan. If the potato dough is sticky, roll it into arrowroot or cassava flour. Roast peanuts in the oven at 100°C till they are hot and the skin comes off easily. Remove the skin. Put the peanuts in a plastic bag. Roll it with a rolling pin to form a coarse powder. If filling the stuffing and making the uttapams is difficult for you, just mix everything into the potato mixture and make uttapams.